Buckeye Union School District David Roth has officially become a Rotarian. 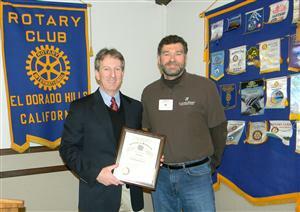 Roth became superintendent last summer, replacing retiring superintendent and EDH Rotarian Terry Wenig. Roth came to our community after nine years at the Piedmont Unified School District, first as the director of special education and then as assistant superintendent for educational services. He earned a bachelor's degree in psychology from California State University, Northridge, a master's degree in psychology from University of California, Berkeley, and his doctorate in Education from UC Berkeley. He was an assistant professor of psychology at University of Pacific and school psychologist at Albany Unified School District before moving to Piedmont.